Helly Kitty sugary things | ZOMG, Candy! I picked these up at Dave & Buster’s along with the SweeTarts Squeez. 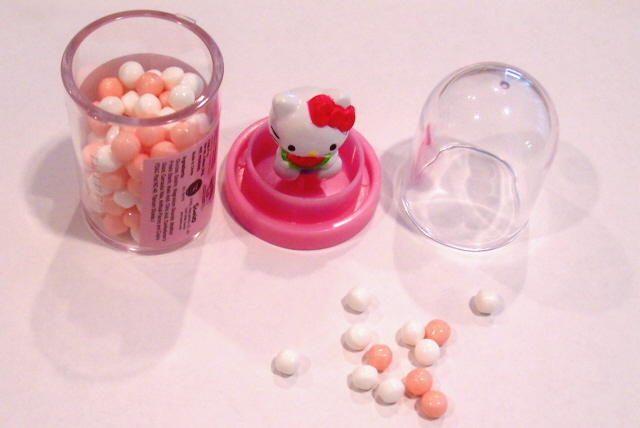 They’re technically not Asian candy, but Hello Kitty is Asian, so I’m filing her as such. I didn’t expect these to taste good, since the toy is the selling point here, and they didn’t. But that doesn’t matter, because it’s a tiny Hello Kitty eating watermelon, and it doesn’t get much cuter than that. The little pink and white beads of candy are slightly smaller than Tart ‘N Tinys and taste faintly fruity. They’re made of compressed sugar with a light sugar coating, like Sprees and Tart ‘N Tinys. My blind taste test revealed that the white ones and the pink ones both taste the same. I’d guess that the faint fruit flavor is strawberry, but I’m probably biased by the pink color. Because it’s Hello Kitty, the pinkness may just serve to attract girls and could have nothing to do with the flavor of the candy. The candy doesn’t taste bad, but it doesn’t taste like much and really isn’t worth eating. Besides, I think it looks pretty inside the container, so I’ll leave it like it is. Entry filed under: Asian, compressed sugar, novelty, O, review.